It’s Monday and I don’t know about you all, but It’s always nice to start my week with a little inspiration. The New Year encouraged me to commit to a number of personal goals I’d been putting off. After wavering between multiple paths, I realized that I had to be specific to successfully move forward, because I wasn’t doing any of them well. Fear made it really difficult for me to be definitive, but here I am and it isn’t as scary as I thought. If you’re one of the millions out there who’ve had the good fortune to be able to pursue your passions, or you’re thinking about finally taking a leap, then keep reading. Poet, musician, writer, teacher, producer and artist, Rafael Casal, is a prime example of how diligence combined with the love for one’s work can payoff. As you can tell, he’s a man of many talents but the one constant is storyteller. Over the past ten years of his career he’s evolved from a Poet to a Producer. Casal received his earliest praise for being phenomenal with spoken word (see the video below). Casal has always considered language to be essential to one’s education. His involvement with Youth Speaks, a San Francisco non-profit that touts knowledge of the written and spoken word as the primary tool for self-empowerment, placed him in a teaching/mentorship role for many kids in the Bay Area. Casal’s experience as a teacher and performer would eventually bring him to the University of Wisconsin, Madison where he ultimately received his Bachelor’s and became the University’s new Creative Director for their emerging performing arts program. After 2 and a half years tirelessly working at UW, he found his way back to California. He recently formed GETBACK Productions with the partnership of several friends and creative powerhouses. Their goal is to create engaging content across all platforms, music, film, theater, print and whatever else lends itself to storytelling. Additionally, he’s gotten one of his plays into production, is set to release a new album, WHOVILLE LP, on February 2nd, and has just relocated from the Bay to LA to pursue his dreams. You started performing at a very young age. At what point did you realize, this is what I was born to do? I don’t know that I have realized that yet. I feel that way about each project that I dedicate myself to, but there is no umbrella over them all that feels like a “born to do” sort of thing. I know broader truths about myself: that I love to inform the uninformed, to supply perspective, to question. It’s empowering to both realize what you do not know, and use what you do. The first, is the lit fuse that triggers the second. In ten years I could be anywhere/one in the world, but I’ll bet I’ll be creating, and teaching. You started out in spoken word, from there your passion grew into music, then theater, and production. How has your process evolved? Are there any elements that are a constant regardless of the medium? The fundamentals of each art form are very similar. They are all about expression, they all have a foundation in language, they all require an audience. Poetry is a great gateway art form, because it, in many ways, is the most open-minded. Poetry has so many forms, takes so many shapes, and accepts all as valid. A play can be poetic, many argue that music itself can be /is poetry. In that, there is no reason to consider them anything BUT poetry. Another structure to master, towards the same idea – tell a story, convey a feeling, provoke a reaction. For the audience, there are distinctions. My music, for example, is a very impulsive art form. I make it a point to not sit and over think my songs, I want them to be snapshots of my consciousness, which tend to be shallow or simple in origin. We are all very similar creatures at our core, and the commonality of that truth is often the beauty of music. It is why we write songs about love over and over again, why we complain about poverty, why we write about happiness and hopelessness – they are common, daily, universal experiences. Poetry is very much a humorous/angry/contemplative art form. It (to me) is all about insight, perspective, wisdom. It should feel premeditated, and intentional. Theater, is very much a beautiful middle ground between the two – each character is impulsive, seemingly simple, filled with commonalities for the audience to identify with or rebel against, but the whole play is one big poem. Same structure, same sense of intent and perspective. How important has mentorship been in your development as student, teacher and artist? Mentorship is everything. It is overwhelmingly important to have close mentors, and to be a mentor to others. The term mentor is loosely used, but a true mentor feels responsible for you, has your best interests in mind but does not keep you from falling. They aren’t your parent, they are mentoring you for the betterment of your craft. My mentors have had a profound impact on my art and my life, and I pay it back by mentoring those who look to me for that guidance, that I feel can achieve what they are striving for. It is…a brilliant relationship, to be a mentor and to be a mentee. It keeps you forever a student, and simultaneously forever a teacher. Humble, questioning, practicing leadership, and always growing. What brought you to the University of Wisconsin? The stars aligned just right for me in Madison. I was touring, and one of my mentors was in residency there. He brought me out to perform and speak to his class, and while I was there I was introduced to some folks who were trying to build a spoken word-based diversity scholarship 4-year undergraduate arts program. A mouthful, and was as ambitious as it sounded. With noble intentions, they were in way over their head and my mentor would soon be leaving. They began the program, and for the first year I came back to Madison a few times for performances and worked very briefly with the first batch of students. A member of this program’s staff heard that I had never finished my Bachelors degree and put an offer on the table – If I moved to Madison, I could be Creative Director of this new university program, design the 4-year artistic curriculum with the faculty artistic director (who would soon become my next mentor, Chris Walker) get a slam salary, and a full ride to the university to finish out my degree. It was an overwhelming task – it would mean that I would work full-time, and go to school with nearly 21 credits a semester. But it also meant getting to design one of the first programs in the country that was about developing new aesthetics in the writing/performance world, while giving young artists of color a free education. It was all the things I stood for, and so I packed up and moved. What has been the scariest part of your career? Frequent, unexpected poverty. Not knowing how to survive. There is no 10 year plan for a renegade career; just hope, leads, and faith. How about the most exciting part? I have priceless stories. And as a writer, I live for stories. 2012 – new album, continue to get my newest play developed, trying to get some web series ideas developed, take some trips, have some adventures, write about them . 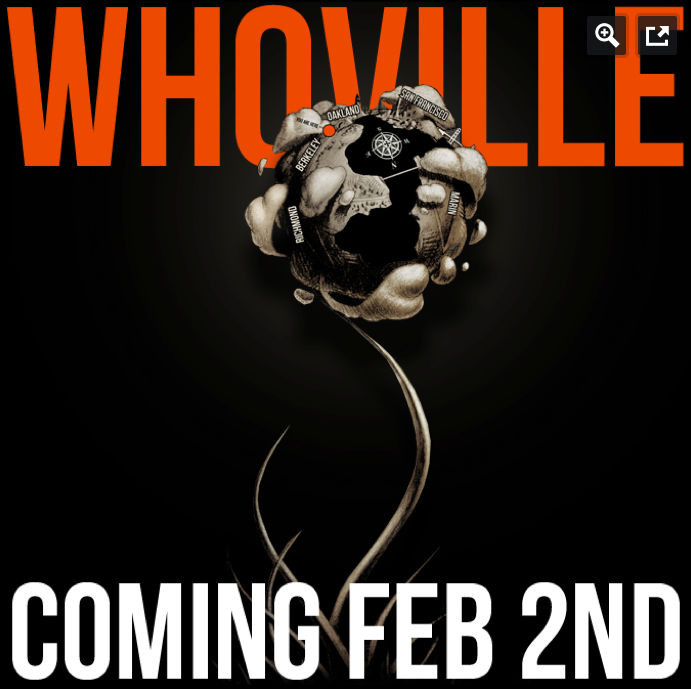 What can we look forward to on your new Whoville LP on Feb 2nd? Oh just a lot of surface level ranting and me holding up a mirror to myself. I lot of ugly honesty, some sexism, some critique of my own sexism, bragging, great melodies and production, clever punchlines and a solid number of analogies. Yeah…its THAT good/bad. If you could give one piece of advice to a new artist, young or old, what would it be? Take in far more than you put out. Whether you take in others art, or life, you need perspective to write perspective. Living is the best research. Thank you, Rafael, for being so open, honest, and thoughtful! Check out The Getback’s website here and Rafael’s website here. And, if you’re feeling socially inclined you can get the latest updates by following @rafaelcasal on twitter! I hope that this provided a little jump-start to everyone’s week. This goes to show that if you chase your dreams you might just catch them. It’s refreshing to see someone fearless. Here’s a link to a preview from Rafael’s 2011 Album. This entry was posted in Artist Spotlight, You and tagged dreams, inspiration, poetry, rafael casal. Bookmark the permalink.